The Pakistani Taliban have visited Syria to assess "the needs of the jihad", says an official with the organization. The Pakistani Taliban have visited Syria to set up a base and to assess "the needs of the jihad", a Taliban official told the BBC over the weekend. The official said that the base was set up with the assistance of ex-Afghan fighters of Middle Eastern origin who have moved to Syria in recent years. At least 12 experts in warfare and information technology had gone to Syria in the last two months, he told the BBC. Mohammad Amin, a senior Taliban operative and "coordinator of the Syrian base", told the BBC that the cell to monitor "the jihad" in Syria was set up six months ago. He said that the cell has the approval of militant factions both within and outside of the Tehrik-e-Taliban Pakistan (TTP), an umbrella organization of terrorist groups fighting the Pakistani forces. The cell sends "information and feedback" on the conflict in Syria back to Pakistan, he told the BBC. "They were facilitated by our friends in Syria who have previously been fighting in Afghanistan," Amin said. Their job is to "assess the needs of the Jihad in Syria, and to work out joint operations with our Syrian friends," he said. "There are dozens of Pakistani hopefuls in line to join the fighting against the Syrian army, but the advice we are getting at the moment is that there's already enough manpower in Syria," according to Amin. A number of Taliban groups in Pakistan have sectarian leanings, and resent the rule of Syrian President Bashar Al-Assad over Sunni Muslims who constitute about three-quarters of the Syrian population. There is already a heavy presence of jihadist forces affiliated with Al-Qaeda among the rebels in Syria. 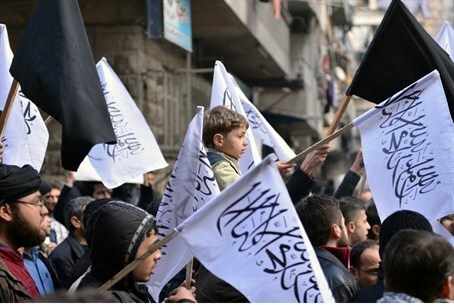 Reports last week indicated that local infighting between Islamist rebel factions – and between the jihadists and the more moderate opposition forces – has begun in Syria. The violence is taking place despite the fact that the civil war between the opposition fighters and loyalists defending Assad has not yet ended. A merger formed between the Islamic State of Iraq, and al-Sham (ISIS), the Syrian unit, has been working to swallow northern Syrian real estate over the past year. It also is becoming increasingly clear that ISIS has swallowed the local Al-Qaeda-linked Jabhat al-Nusra (Al-Nusra Front), which once was the largest faction in the Islamist Front for the Liberation of Syria – the 13-member rebel coalition that broke away from the main opposition force. Last week, Syrian rebels linked to Al-Qaeda killed a senior figure in the Western-backed Free Syrian Army (FSA). On Saturday, fighters from the FSA clashed with jihadists from ISIS.